Orders up to £49.99 are subject to a charge. When ordering you may select either a £4.95 delivery charge for next day delivery (see above terms) or a £2.95 delivery charge for a 2 - 5 day service, Live Animals are only available on the £9.95 Live fish/ Turtle delivery service see Live Fish/Turtle Terms and Conditions for more details. Orders over £50.00 are delivered free this includes Live Animals. The following UK postcodes AB30-56, IV, HS, KA27-28, KW, PA20-49, PA60-78, PH17-26, PH30-50 and ZE will incur an extra delivery charge. The Isle of Man (IM), Northern Island (BT) and Isles of Scilly (TR21-25) are all subject to additional delivery charges. Please contact us for additional delivery charges. For other destinations please contact our customer services department. 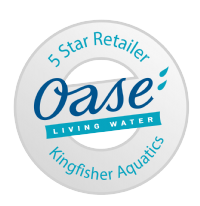 Angelfish Aquatics offers next day delivery on your goods if purchased before 1pm and providing that they are in stock. As our courier does not deliver Saturdays or Sundays, we cannot offer next day delivery on order received after 1pm on Thursday until Sunday . All order received during this period will be packed and sent Monday for delivery Tuesday. Please note, although 95% of order get to their destinations the next day, we are unable to guarantee this service so please allow 2-5 working days providing they are in stock. If goods are not received within 21 days, contact us direct and we will offer you alternative products to the same value or a full refund. All out of stock orders will be held on back order and dispatched as soon as they are stock (We will keep you up to date via email). Goods must be signed for upon delivery and any damages/shortages reported to us within 24 hours. Angelfish Aquatics denies any liability for any consequential loss caused by damaged or faulty items, delay in dispatch or delays by carriers. We cannot accept any liability involving third party contractors and would advise that no arrangements be made for installation until you are in receipt of your order. If you live outside of these Post Codes, please email for a quotation on palletized delivery or to arrange collection. We only offer a curb side delivery. This means we will not carry the aquarium through your house or up a set of stairs to a flat. Free delivery is only offered on Aquarium and Cabinet sold together. Free delivery will only be made between 6pm and 10pm. Once ordered has been placed, we will contact you to arrange an evening. The products being returned must be securely packed to avoid damage. We recommend returning the products by recorded delivery using Parcel Force. Angelfish Aquatics does not accept responsibility for goods returned by a customer, but which are not received, unless proof of delivery to us or receipt by carrier is supplied. Return of goods after 7 days is at our own discretion. We work with the manufactures to ensure their guarantees are honored within the warranty period. We can only refund postage costs under the manufactures guarantee if the goods are returned to us within 7 days of the original purchase. We can only offer replacements parts or replacement goods when authorized by the manufacture. Under no circumstances should goods be returned to us without prior approval. We can only replace glass bulbs, tubes and lights if notified within 7 days of delivery. Advertised price. The total price payable for the goods will be stipulated at the time when you place your order. We are entitled to make adjustments to the price to take account of any increase in our supplier's prices, or the imposition of any taxes or duties, or if due to an error or omission the price published for the goods is wrong. We will inform you of the correct price and give you the opportunity to cancel the order.